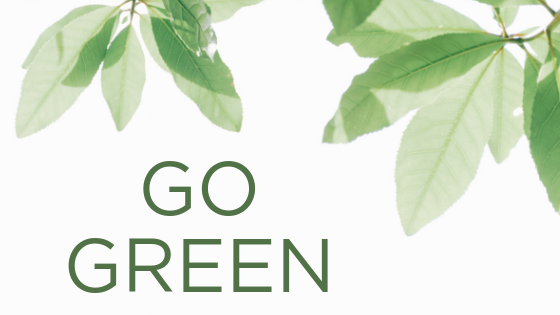 Here at Ambre Blends, we are dedicated to being a green business. When we moved into our current building, we knew we wanted to do more to be green. Not only does it create a healthy environment for our employees and customers, but it helps leads the way for social change. Here are few ways we try to be a more sustainable, environmentally-conscious company. Does your office have a water cooler? In our office, we use Bottle Free Indy to keep us hydrated and happy. These bottle-free water coolers provide us with three different temperatures for one low monthly cost, which is easy for both us and the planet. Plastic water jugs used by water delivery companies often contain Bisphenol A (BPA), a compound that has been linked to health issues. With bottle-free, we don’t have to worry about our health and the quality of our drinking water. Ambre Blends also participates in IPL’s Green Power option to support environmentally friendly, renewable energy sources. What that means is that 100% of our electricity use is to be generated by renewable sources such as Indiana wind farms. If nature is making it, why shouldn’t we use this sustainable energy source? This, in turn, reduces our reliance on fossil-fueled power. IPL’s Green Power is available to both residential and commercial customers. In addition to IPL’s Green Power, we use all LED lighting at the Ambre Blends Disco Hut. To make sure lights aren’t kept on, we use light timers and occupancy sensors to reduce electrical usage. When it comes to printing and packaging, we have been printing all of our marketing material on FSC certified paper. You might notice the FSC-Certified stamp on our materials, which stands for Forest Stewardship Council. The Forest Stewardship Council certification gives customers the option to choose forest products like paper and wood that have been sourced in an environmentally-friendly, socially responsible and economically viable manner. Our packaging is recyclable and uses biodegradable materials to keep your products safe while they travel to you. We use a patented machine called Geami to package our orders. The Geami uses environmentally friendly paper through a patented process to protect items from damages. Speaking of recycling, we practice what we preach in-house as well. We recycle on a five-to-one basis, meaning that we only go through one bag of trash for every five bags of recycling at the Ambre Blends Disco Hut. In addition, we also recycle and reuse all packaging materials sent to us! We have created refill bottles for your favorite Ambre Blends products to not only save you money but to help save the environment. For example, we sell 30ml refill bottles of our Oil Essences to refill your 10ml roll-ons. You save more than 15% when you buy a 30ml bottle and have less waste than buying three 10 ml roll-ons. You can purchase the larger refill bottles in the Body Cream and Spritzers as well. Using green business practices can help us prevent the waste of natural resources, reduce our ecological footprint, improve our health and even save you money in the long run. Green business is smart business. Do you practice corporate social responsibility?